According to U.S. Department of Transportation, our national system serves nearly 319 million Americans. In fact, the success of our economy is driven by connecting over 7.5 million businesses with customers, workers, and suppliers. SES America’s line of customizable small-signs goes beyond selling signs; this mix of NEMA compliant off-the-shelf and fully customizable solutions can increase road safety, reduce traffic congestion, display regulatory, warning, and guidance information, are simple to operate, and more - at a fraction of the cost of a dynamic message sign. 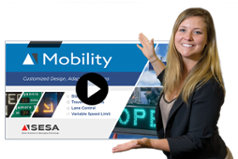 Watch this special webinar dedicated to our innovative mobility solutions to discover how they can improve the success of your next ITS project - and the transportation of 319 million Americans.